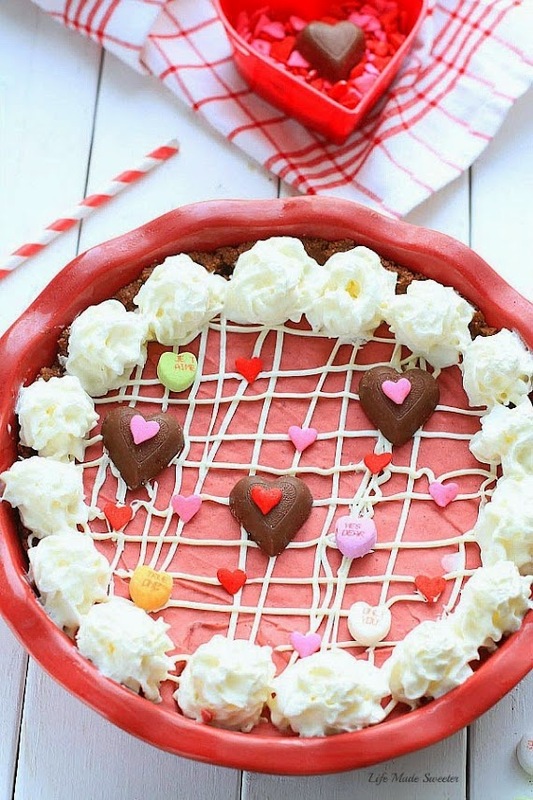 Easy no-bake pie with a light red velvet flavored cheesecake filling on a chocolate cookie crust. Valentine’s Day is just a couple days away and I’m back to share another red velvet recipe. The hubs and I are staying in this year but that doesn’t mean there won’t be any dessert. I can never decide on just one thing to make so I usually end up making a few easy recipes and then we get to have a little bit of each on the big day. This is an easy no-bake cheesecake pie with an oreo cookie crust. I love making no-bake desserts because they are so simple to whip up and red velvet seems to go hand in hand for Valentine’s Day these days. I didn’t add too much food coloring this time so feel free to add more or less depending on the color you are trying to achieve. I tried to lighten it up slightly by using low fat cream cheese and non-fat Greek yogurt in here. Feel free to use what you have on hand though. Top it off with some heart sprinkles and heart chocolates and you’ve got one pretty dessert that will surely impress your sweetheart. 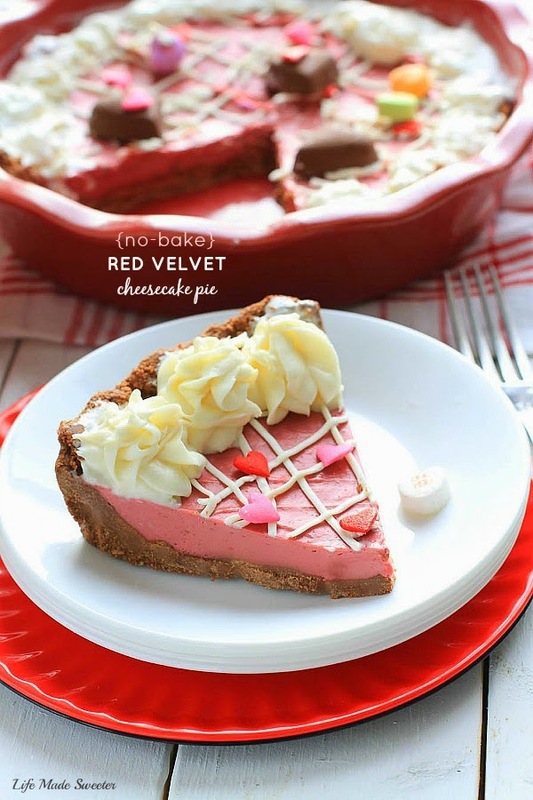 Easy and delicious no-bake pie with a light red velvet flavored cheesecake filling on a chocolate cookie crust. Greek yogurt, low fat cream cheese and light whipped cream are used to make the cheesecake filling nice and light. In the bowl of your food processor, add the chocolate sandwich cookies and process until they are fine crumbs. Combine the crumbs with the melted butter and firmly press into a 9-inch pie dish. Set aside in the fridge to set up. Meanwhile, using your stand mixer or a hand mixer, beat the cream cheese until smooth. Add the Greek yogurt and vanilla extract and beat until combined. Slowly add the red food coloring, cocoa powder and confectioners' sugar and continue beating until well incorporated. Gently fold in the whipped cream or whipped topping. Spread the cheesecake filling into the cookie crust and refrigerate for at least 2-3 hours. 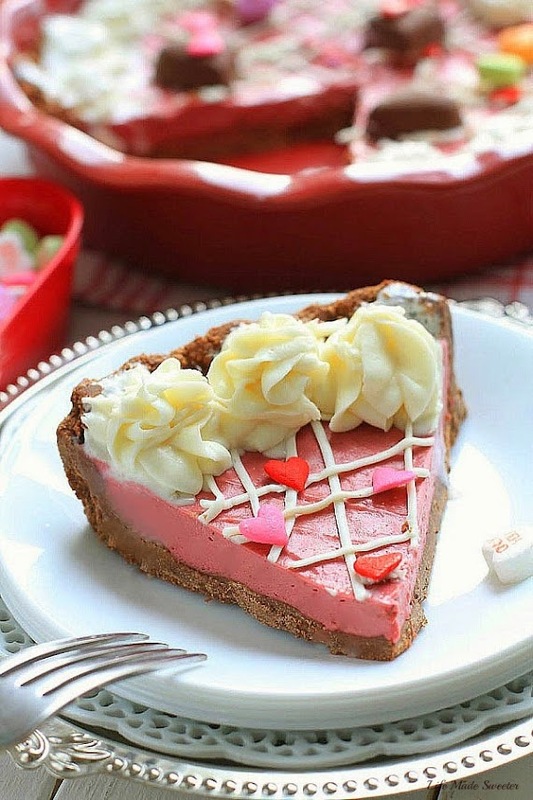 Serve topped with whipped cream, chocolate, sprinkles or conversation hearts if desired.